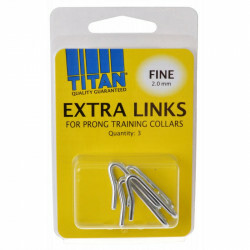 The Titan Easy-On Prong Training Collar is the perfect tough, safe and effective training collar for your willful dog. This chrome-plated collar features a nylon loop for optimum durability and strength, and will not tarnish, rust or break. The loop and buckle make connection and removal quick and easy. This collar is safe and humane for dogs. We had a collar that didn't have the clip on feature, it was a pain to put on and take off. This collar works great. So far, the collars have held up well. The price is AMAZING, especially compared to the stores and other websites I've found them on. Thank you PetMountain! 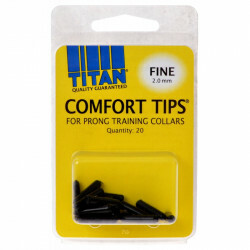 This is the best prong collar. I ordered one for my dog and then ordered another for my son's dog that I often babysit. The collar is so easy to use and does not hurt my fingers or my dog getting it on and off. This product needs more advertising because it's amazing and I didn't know it was available. I happened to stumble on it searching for a new prong collar that would be easier to use. Having two labs to walk is great for exercise but the pulling on the shoulders and arms is not! Until now! This collar is much easier to get on both dogs than the traditional prong collar that we had for the first pup. Bought this training collar and it is wonderful. Good quality, great price and easy to put on our dog!!!! Will continue to use your products! Great price. Good quality. Thanks much. Really like the collar for my pet classes. Much easier for students to get control of unruly dogs. Easier to get on and off of dogs and maintain correct fit. Works well to control our new dog. However, difficult to put on over her head. Would rather have a model that has a clip to more easily install.